Elon Musk, CEO of electric car maker Tesla and space exploration firm SpaceX, has plans for a futuristic transportation system known as the Hyperloop. Here's a look at the South Africa native's wide-ranging business successes to date. 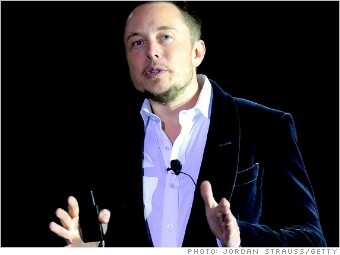 Musk's ventures have earned him a fortune worth $7.7 billion, according to Bloomberg, and have made him one of the country's most visible entrepreneurs. Film director Jon Favreau says Musk helped inspire the on-screen version of Tony Stark in the Iron Man films, the billionaire inventor and superhero. Musk showed evidence of his genius from an early age -- he sold his first software program, a video game called Blastar, when he was just 12 years old.